Get ready to be transformed for success and to achieve your dreams so you’ll be prepared to take on whatever comes your way. Developing your potential at CW happens both inside and outside the classroom. We offer many opportunities for personal, social, cultural and professional growth. Getting involved with clubs and other on campus activities will enrich your CW experience and help you develop leadership skills to use for the rest of your life. Dive into the unique CW student experience. Have fun, make new friends and find opportunities to celebrate. The Honors Program for Associate Degree students at The College of Westchester offers an enriched course of study for exceptional students. Eligibility is based upon performance in high school or college and a personal essay. To qualify a student must have a high school and/or college grade point average of 3.0 or better. Students may apply at any point during their associate program and must complete it by the end of the program. Once students are accepted into the Honors Program, they will complete three research papers of choice while pursuing their degree. Students must maintain a grade point average of 3.0 in order to maintain membership in the Honors Program. Honors Program graduates wear a stole over their gowns at Commencement. This honors seminar is designed to introduce high-achieving bachelor-level students to research. This credit-bearing course provides select students with an opportunity to conduct original research under the supervision of a faculty researcher. Bachelor-level students will learn about the academic research process through presentations, guest lectures and research assignments. At the conclusion of the seminar, student researchers will showcase their research projects at college sponsored colloquia. Eligibility includes junior status, a minimum of a 3.5 grade point average, demonstrated research ability, and recommendations from bachelor-level faculty. Successful completion of this course will culminate distinction at graduation. Phi Theta Kappa is not only recognized as the official honor society for two year colleges by the American Association of Community Colleges but also is the largest honor society in American higher education. 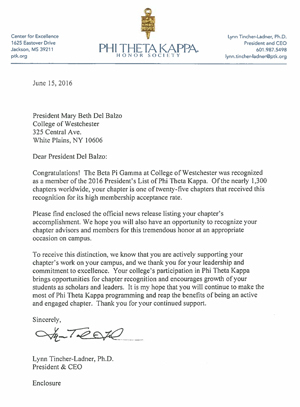 Beta Pi Gamma, The College of Westchester’s chapter of Phi Theta Kappa, inducts members semi-annually and eligibility is based on completion of 24 credits at CW and maintaining outstanding academic achievement of a 3.5 grade point average. Membership in Phi Theta Kappa is a valuable addition to the college experience and offers students more than $36 million in transfer scholarships. The intent of Sigma Beta Delta Honor Society is to encourage and recognize scholarship and achievement among students of business, management and administration, and to encourage and promote personal and professional improvement. Membership in Sigma Beta Delta is the highest international recognition a business student can receive at a college or university with a Sigma Beta Delta chapter. To be eligible for membership, a business student must have completed 72 credits and rank in the upper 20 percent of the junior or senior class and be invited to membership by the faculty officers. Published each semester, the SGA newspaper, Student Voices, is comprised of articles, photographs, and artwork submitted solely by students about all aspect of students’ lives. The Student Government Association (SGA) exists to support and stimulate the academic, cultural, social, and physical welfare of all students at The College of Westchester and serves to make decisions on behalf of the entire student body. Comprised of a committee of equal participants, any student with the necessary commitment, interest, and time may be a member of the SGA. The SGA represents the best interest of students by sharing student concerns with The College administration, serving as a source for student representation on College-wide committees, recommending student activities, managing student events, and supporting official College programs, initiatives, and functions. The SGA is highly regarded by both faculty and students. It gives students the opportunity to exercise leadership, express opinions, and work together toward achieving common goals. Maintaining close ties with our alumni is an important goal of our college. We encourage graduates to remain active by gathering with fellow graduates for recreational outings, serving on an alumni steering committee, speaking to CW classes, becoming involved with our Career Services Department, and attending alumni meetings. Lifetime placement is also available to alumni and many of our alumni take advantage of this service. The Stars and Stripes Student Support Club is a student organization that is a source of support to student military member and veterans in their transition to college. It provides positive engagement between military members/veterans and other students on campus.